At a recent bookstore event, I experienced a cringe-worthy moment. Oddly, my distress involved a pair of shoppers interested in buying my novel, THE NAMESAKE. It’s not that these patrons were creepy or threatening. In fact, they were friendly, talkative. Heck, they looked like they’d walked straight out of a breakfast cereal commercial. The thing is, it wouldn’t have been a fiber-rich brand for grownups or health-conscious teens. Nope, this mother/child duo squarely fit the sugary-kid-cereal demographic. So what made me write a story that would lead to bookstore angst and uncomfortable coffeehouse interactions? Hard to say. I actually didn’t set out to write about sexual abuse—certainly not of the clergy variety—but it’s a topic that matters to me, and it has a way of surfacing in my writing, both my poetry and fiction. Once it became clear that the story needed to “go there,” I fully committed to telling it. Well, after some unsuccessful attempts to twist the tale in other directions. Writing honestly about abuse meant facing some dark moments throughout the process, and questioning myself every step of the way. It was very difficult to put Evan, a character I’d grown to love, through the emotionally excruciating experience of uncovering his father’s painful past. There were moments when I considered just giving up. But creating THE NAMESAKE was not a task I took lightly; it felt important, and not just for my own sake. At every turn, I imagined my future readers and how they might respond. It seemed like a disservice to them to back away from telling Evan’s story. 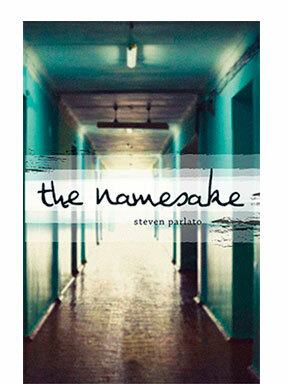 Some adult readers have called THE NAMESAKE too graphic and depressing for YA readers. While I agree the content is dark and mature, I actually took great pains not to be overly graphic. Most of the abuse is not described in detail. I honestly believe the book feels graphic because of the reader’s ability to imagine and visualize the horrors I’ve hinted at in the novel. Having Evan’s father suffer sexual abuse rather than Evan himself was a conscious choice; I felt it would provide the reader a protective emotional cushion. And while I knew the presence of hope was essential, it was equally important to honor those who’ve survived abuse by portraying that experience realistically, minus sugarcoating. Those probably well-meaning adult readers overlook something crucial when they say the book is too heavy for young adults. It’s the fact that teens today are aware of more than we may wish they were—this has probably always been the case. They’re aware because they, or people they care about, are struggling with similarly tough content in their own lives. When we write authentically about dark, controversial material—obviously tempered with hope and humor—we show respect and concern for their experience. Maybe we even help one or two of them to cope with the darkness of their own lives. At least, I hope so. For me, that would be the best possible outcome of the journey I went on in writing THE NAMESAKE. Knowing the book had been meaningful to even one young person, making him or her feel less alone and somehow more understood, would make it all worthwhile. As for that mother/child team who were interested in buying my book, I told them it was “rated fourteen and up for mature content.” The mom said, “Well, maybe we’ll read this one together.” Definitely another squeamish moment. But I fought the instinct to wrench the book from her hand. Instead, I happily inscribed it and sent them on their way, secure in the belief that each book finds the reader it’s meant for, and that a kid whose mom supports him in reading a “tough” book is a kid whose parent believes in preparing him for the real world. And I swear my daughter will get to read THE NAMESAKE one day soon, when she—or maybe it’s me—is really ready.